According to Statista, only 81.3% of Americans intended to celebrate Easter in 2017. The result? In 2013-2014, Americans spent appx. $15.9 Billion dollars on Easter. Metro.us says that’s $137.46 for the average American. Seventy-five dollars a year works out to $6.25 a month. Less than a Netflix subscription. If 2/3 of America were willing to do just that, for one year, 6.125 billion dollars would be raised. In the first year alone. According to the GAO in 2009, the most expensive stretches of barrier averaged $3.9 million dollars per mile. One of the more recent estimates, according to CBS news in February, is that it could cost more than $21B to complete a significant portion over the next three years. 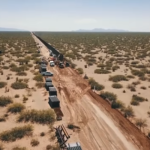 The report cites that would complete 1,250 more miles of the border, which would average $16.8 million per mile. They provide no evidence why the cost would more than quadruple over the 2009 costs, so it can safely be assumed that’s rhetorical fluff designed to scare people away from even starting. It’s fair to expect costs have risen, let’s say to $6.5M per mile just to be conservative. In that case, the total cost over the next three years would be 8.125 billion, which unironically is just about what Trump estimated it would cost. That’s 1.3 Halloweens, or just over half an Easter. Do as many Americans want to build the wall as celebrate Easter or Halloween? We expect we’ll find out. We hope you’ll be willing to spread the word with us, so as many people get to decide for themselves whether it’s worth it to them as possible. By comparing spending on the holidays above to the project we’re undertaking here, we certainly don’t mean to suggest skipping a holiday and donating the money to us instead. What we do want to do, however, is show the proportion of what we intend to raise – the amount is far more reachable than it might at first seem. As we’ve seen in the political campaigns, large amounts can add up from many small donations in a short period of time. The good news for this project is that there isn’t a finite end date like there is with a political campaign. We are here for the long term, until the last section is placed and contractor’s invoices paid. If the final costs of the remaining mileage do turn out to be more like $15.9 billion, then we can know that’s about $138 per adult citizen. Why wait for them to spend and/or raise tax money for it? If we fund it ourselves, now, it takes the initiative away from both Democrats and Republicans in Congress. They won’t be able to block or place onerous restrictions on how its spent without in the least making their position patently clear to their constituents, and the 2018 elections are fast approaching. Please commit today, and together we can fund this wall before the next election!